"In flying, Büchner wasn't that much superior to us as it looked from the difference in the number of victories, We also knew fighting turns and maneuvers. He only surpassed us in deciding the moment --- the moment when you smelled the enemy's castor oil and pushed the button. And that moment he'd found out." Credited with 40 Allied warplanes, all in the waning months of the war, Büchner flew a machine that matched his talents: Anthony Fokker's D.VII biplane. The 160 horsepower Mercedes D.III in-line engine powered several new models tested at Adlershof that January, among them the Fokker D.VII prototype. Reinhold Platz, Fokker's chief designer, largely created the D.VII, while Anthony Fokker tested the aircraft, guided critical improvements, and marketed the airplane to Germany's military. Fokker's egotistical personality led him to minimize Platz' important contributions; in his autobiography, he did not even mention Platz by name. During the January tests, Manfred von Richthofen tested the new airplane. While delighted with its maneuverability, he found it a little unstable, especially in a dive. To improve stability, Fokker lengthened the fuselage and added a vertical rudder fin, among other changes. The result was easy to fly, maneuverable, and safe. The Red Baron endorsed it wholeheartedly. The Adlershof trials showed Fokker at his best, quickly modifying the plane to meet requirements, charming the German aces, and (most importantly) delivering a fighter that offered good, all-around performance. So taken were the pilots with the new Fokker biplane that the Kogenluft (Kommandierenden General der Luftstreitkräfte) ordered 900, with 300 to be built at Fokker's Schwerin factory and 600 under license at Albatros factories in Johannisthal (Albatros-Werke G.m.b.H.) and Schneidemühl (Osdeutsche Albatros Werke). Fokker had not prepared any construction blueprints; the aircraft had been built from jigs and assembly sketches. So Albatros had to make its own drawings based on a finished airplane. The resulting airplanes inevitably differed in small ways. Surprisingly, the Albatros machines, designated Fokker (Alb) and Fokker (OAW), were felt to be of higher quality than those made by Fokker itself..
"When can I expect to receive the [new] Fokker biplanes with the high compression engines? The superiority of British single-seat and reconnaissance aircraft makes it even more perceptibly unpleasant here. Their single-seaters fight by coming over at high altitudes and staying there. We cannot even shoot at them. Speed is the most important factor. We could shoot down five to ten times as many if we were faster. ... Please give me news soon about when we can count on the new machines." Of course, Richthofen never flew the new machine, as he was killed on April 21st. The Fokker D VII, arguably the best fighter of World War One, weighed just under 2,000 pounds, measured 23 feet in length, with a wingspan of 29 feet 4 inches. Later models, powered by a 185 hp BMW IIIa engine could make a top speed of 125 MPH. (Due to engine shortages, there were never enough BMW-powered Fokkers.) It could climb to 5000 meters in 18 minutes and to 6000 meters (its operational ceiling) in 28 minutes. Its twin, synchronized 7.92mm Spandau machine guns were standard firepower for the era. When it first arrived, Allied pilots didn't know what to make of it, at first underestimating the boxy, ungraceful fighter. It seemed to be able to "hang on its prop" and fire directly upwards into the vulnerable bellies of Allied two-seaters. With its thick wing section, it had excellent stall characteristics; it could get behind and below an enemy airplane, pitch up its nose under full throttle and fire away. Typically the tail fins were painted white, with a black cross. Over 1000 D.VII's were built, with 775 surviving at the end of the war. So highly regarded was this fighter that the Treaty of Versailles specifically mentioned that these aircraft were to be turned over to the Allies. Canada, Britain, and Australia received some; a few were preserved in museums, the remainder scrapped. European countries like Hungary, Netherlands, Lithuania, and Latvia used them for their air forces through the 1920s. Anthony Fokker himself smuggled 220 of them to his native Netherlands. Surviving, original Fokker D VIIs can be found at the National Air and Space Museum in Washington DC, in the Royal Air Force Museum in London, in the National Aviation Museum in Ottawa Canada, and several others. The one on display at the Smithsonian National Air and Space Museum belonged to Jasta 65. Just before the Armistice, Lieutnant Heinz Freiherr von Beaulieu-Marconnay, brother of the ace, landed his D.VII at the 95th Aero Squadron airfield near Verdun. It bore the decoration "U10," for the pilot's former unit, the 10th Uhlans. The U.S. War Department gave the aircraft to the Smithsonian in 1920; it was restored in 1961 and sits there today. I saw it in my visit to the NASM in September 2000. Scores of German aces flew the Fokker D.VII. 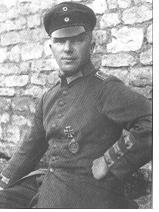 while Erich Löwenhardt, Ernst Udet, Lothar von Richthofen, Rudolph Berthold, Franz Büchner, Bruno Loerzer, and Paul Bäumer, amassed more than 40 victories, they were exceptional. More representative of Fokker D VII aces, by number of victories, by age, by previous career, and by postwar activities, was Oblt. Oskar Freiherr von Boenigk. Born in 1893 in Silesia, he was commissioned in 1912, served in the infantry, and was twice wounded. He transferred to the air service as an observer in 1915 and after pilot training moved over to Jasta 4 in June 1917. He scored 21 kills, which somewhat atypically included seven balloons, and was promoted to CO of JG II in August 1918. By the end of the war, he had run his total to 26 and was awarded the Pour le Mérite. He fought in Germany's postwar civil strife and served in the Luftwaff in World War Two, rising to the rank of Major General. He was captured by the Russians toward the end of the war and died in a POW camp in early 1946. The Fokker D.VII File - an excellent site by H. Vossers, with detailed comments on Fokker D.VIIs in other countries after WWI.